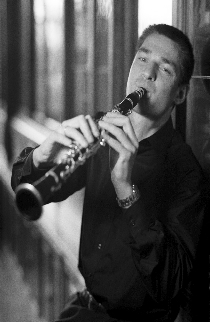 Andreas Schablas, clarinet, was born in Muerzzuschlag (Styria). He studied at the local Johannes Brahms School of Music and at the Music Universities in Graz and Vienna, principally with Johann Hindler; additional studies with Peter Schmidl, Alfred Prinz and Kurt Daghofer. He gained prizes in numerous competitions, was a finalist in the 1992 EBU competition for young musicians in Brussels, and was awarded scholarships by the Vienna Symphony and the Vienna Philharmonic. For several years he was principal clarinetist in the Vienna Chamber Orchestra, playing as a guest in various Austrian and German leading orchestras. He has been a member of the Salzburg Mozarteum Orchestra since 1999. Andreas Schablas is a member of the oenm (Austrian Ensemble for New Music), and promotes contemporary composition with his comprehensive repertoire for clarinet and bass clarinet. He has a long-standing association with the Altenberg Trio in Vienna, and has performed with Christian Altenburger, Ernst Kovacic, Johannes Meissl, Herbert Kefer, Thomas Selditz, Franz Bartolomey, Patrick Demenga, Reinhard Latzko, Heinrich Schiff, Markus Schirmer, Stefan Vladar, Eggner Trio, Aron Quartett, and Hugo Wolf Quartett. Andreas Schablas is solo clarinet player of the “Bavarian State Orchestra Munich”.